I better get moving if I am going to finish reviewing 2008 by the end of January, eh? 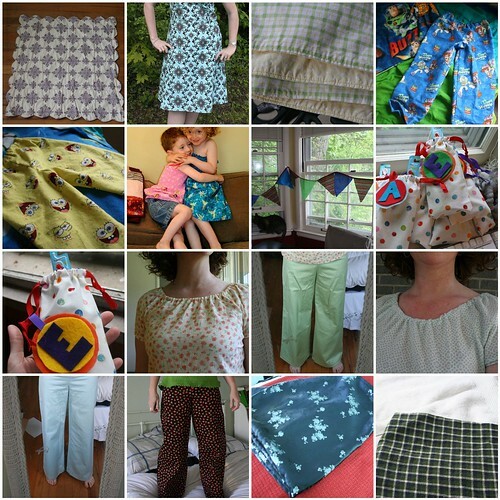 Turns out I have a few unblogged sewn projects. I kept thinking I would get around to it, but they were all such disappointments I kind of didn’t want to revisit them. I sewed three pairs of pants in a row, all Simplicity 4023, with modifications. I had success with that pattern in 2007, resulting in a pair of pants that is still one of my favorites. But I wanted to improve the waist, which was a drawstring. So for the light green and light blue pants, I installed a side-zip zipper. They fit okay but never felt quite right. Then the strawberry pants I did in such a rush (on vacation, in fact, in about an hour). I put an elastic waistband in them, made them too small, and made them too short in the rise. So, an all around bust (except for the adorable print). Second verse, same as the first – I made My Old Man’s son Chris a pair of flannel pjs, per request, in December, and those ended up with a rise that was too short as well. Clearly my measuring abilities are impaired. The odd black thing in the next-to-last square is a sort of stole that I made frantically at midnight before we left for our nephew’s wedding in November, just in case my Moonshadow Stole didn’t work out (thankfully it did). The fabric was a really pretty black and silver brocade that I intend to repurpose for something else some day. I did the bulk of my sewing in February through June. Then my machine gathered dust until those last two items in November and December. I sewed only half as many things in 2008 as I did the year previous. I always have lots of things I want to sew, and I often buy the fabric for them too! But in the end I seem to be mostly consumed with knitting these days. The only real sewing goals I’m setting for 2009 are that I want to learn how to use my serger and I intend to finish my boys’ birthday quilts before it’s their next birthday! Those are some great sewing projects – somehow I missed the Easter Dress – I love it! !